We are excited to announce that Microsoft has once again been positioned as a leader in Gartner's 2018 Magic Quadrant for Data Management Solutions for Analytics (DMSA). 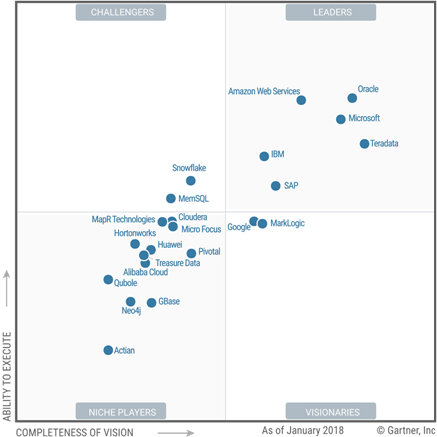 Gartner has also positioned Microsoft as a leader in the Magic Quadrant for Analytics and Business Intelligence Platforms, and in the Magic Quadrant for Operational Database Management Systems. This is an exciting milestone, and it is Microsoft’s perspective that this underscores our global leadership and its relentless commitment to innovation across the data estate. Gartner defines DMSA as a complete software system that supports and manages data in one or more file management systems (usually databases). DMSA includes specific optimizations to support analytical processing. This includes, but is not limited to, support for relational processing, nonrelational processing (such as graph processing), and machine learning and programming languages such as Python and R.
At Microsoft, we've championed a data platform evolution to make big data processing and analytics simpler and more accessible, helping you transform data into intelligent action. We do this through SQL Server 2017 and key Azures services: Azure SQL Data Warehouse (a fully managed, MPP architecture cloud data warehouse), Azure Databricks (an Apache Spark-based analytics platform) and Azure HDInsight (a fully managed open source analytics platform). Productive: with best in class support for SQL, Spark and Hadoop and fully managed cloud services that allows you to provision your data warehouse & spark environment in minutes with a single click. Customers can also accelerate data integration with consistent 30+ native data connectors and empower your data scientists, data engineers and business analysts to use the tools and languages of their choice. Read how Rockwell cut development time by 80 percent for shorter time-to-market, reduced costs, and improved customer responsiveness. Hybrid: Only Microsoft allows customers to leverage the SQL Server’s proven performance and security consistently, in private cloud or as a managed service in Azure. Customers also reduce cost & complexity of managing existing data transformations by consistently running SQL Server Integration Service packages in Azure. Finally, we also enable consistent user experience with common identity across on-premises and Azure. Learn how Carnival built a hybrid solution predicts onboard water usage, saving $200k/ship/year. Intelligent: Customer have the flexibility to build & deploy machine learning models on premises, in the cloud or on the edge. They can also leverage the data science tool of choice with support for the best of Microsoft and open source innovation. And easily distribute insights across your organization through rich integration with Power BI and other leading BI tools. Find out how ASOS.com delivers 13 million personalized experiences with 33 orders per second. Trusted: Built-in advanced security features including Encryption, Audit, Threat Detection, Azure Active Directory and VNET. Azure service also offers 50+ industry and geographical compliances and are globally available across 42 regions to keep your data where your users are. Finally Microsoft offers financially backed SLAs ton ensure peace of mind. Read why GE Healthcare delivers their core solutions using Azure data services. Finally, Azure SQL Data Warehouse significantly improves your analytics while managing costs. We commissioned Forrester Consulting to conduct a Total Economic Impact (TEI) study to detail what happened after the companies moved their data to the cloud. You can also get the Gartner’s 2018 Magic Quadrant for Data Management Solutions for Analytics report to learn more about Microsoft’s leadership in the industry.